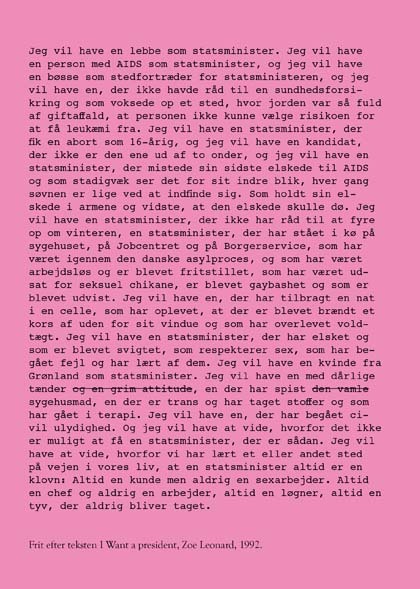 Join a collective reading of 'Jeg vil have en statsminister...' two days before the general election! The readings take place September 13, 2011 at 4.45pm at Rådhuspladsen in Copenhagen and at Rådhuspladsen in Aarhus, Denmark. See the Danish text below. This is a collective reading project initiated by Malin Arnell, Kajsa Dahlberg, Johanna Gustavsson and Fia-Stina Sandlund in connection with the Swedish parliament elections in 2010. 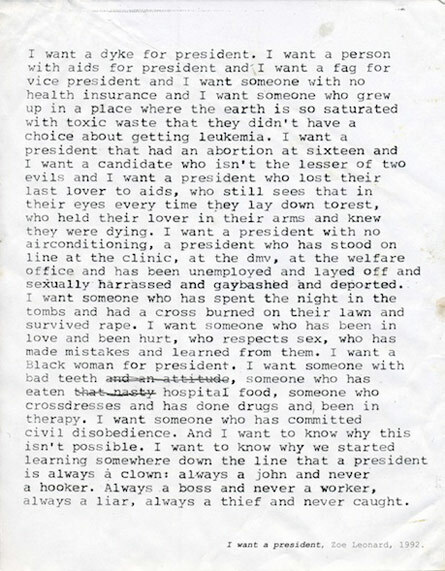 The text that will be read is an adaptation of “I want a president…”, Zoe Leonard, 1992. The text has been translated to Danish by Gritt Uldall-Jessen (see text below). The Copenhagen edition of the reading is held in conjunction with the exhibition “Terms of Belonging” at Overgaden Institute for Contemporary Art. The Aarhus reading is organised by Ditte Lyngkær Pedersen, Lise Skou og Tanja Nellemann Poulsen in conjunction with the poster exhibition “tilVALG!” at rum46 and in Aarhus city. Earlier this year Malin Arnell & Kajsa Dahlberg & Johanna Gustavsson & Fia-Stina Sandlund in collaboration with Zoe Leonard initiated a collaborative reading of “I want a dyke for president…” in Tallin, Estonia in conjunction with the queer exhibition Untold Stories, which dealt with the theme of sexual minorities. Untold Stories was a a part of the Capital of Culture programme in Tallin May 2011. Zoe Leonard (born 1961) is an American artist, photographer and queer woman, based in New York City. A photographer since the mid-1980s, she has been well known since her work appeared in documenta IX in 1992. She captures the transformation of social, cultural and economic changes. Her work for Documenta 12, ‘Analogue‘ (1998-2007), consists of more than 350 C-print photographs of windows of small shops and the products they sell. She explains. “I am interested in making a record of an urban landscape as a way of looking at who we are as a people, who we are as a culture, understanding the city as a social space, … as an economic space”. See Documenta12’s video interview with Zoe Leonard.